An essential nutrient to help fight colds and strengthen your immune system. As an added benefit, Vitamin C helps speed tissue healing and maintains strong bones, cartilage, teeth and gums. Each caplet contains 500mg of Vitamin C (ascorbic acid) prepared in a specially formulated nutrient base of Rosehips, Rutin, Hesperidin, Lemon Bioflavonoids and Acerola. 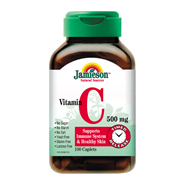 Provides a gradual release of Vitamin C over 6 to 8 hours. Each caplet contains: Vitamin C 500mg. Prepared in a nutrient base of rosehips and vitamin C complex factors of rutin, hesperidin, lemon bioflavonoids, acerola, in a special time-diffused micro encapsulation providing a gradual release of Vitamin C over 6 to 8 hours.